Adventure bikes are exactly what they sound like: motorcycles that are the catalyst for adventure. Some call them enduro bikes or off-road touring bikes. These aren’t full-fledged dirt bikes any more than they are sport tourers. They are designed for long trips that might or might not have pavement. BMW, Honda, Suzuki, KTM, Kawasaki, Yamaha, Moto Guzzi, Triumph, Ducati and others have wildly different views of this world, and we’re happy to present them all. Note that pricing doesn’t include destination, tax or set up. The base prices are given except where noted. 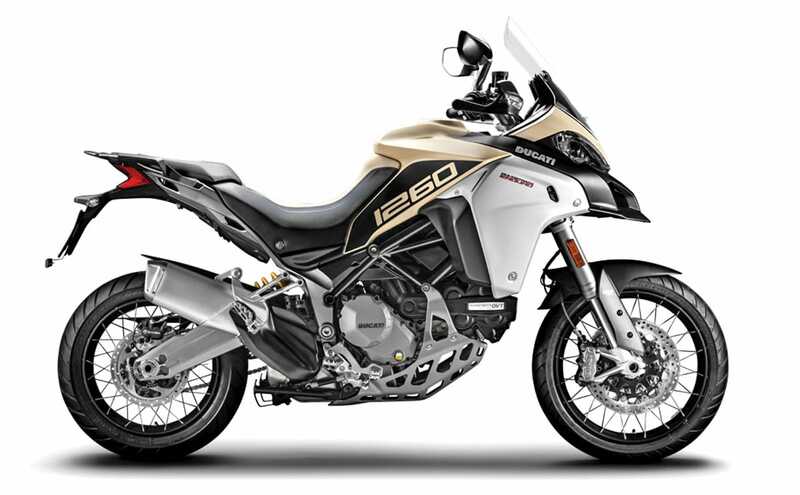 The 1290 Super Adventure R has its roots in the dirt world, but its WP suspension (48mm fork, 220mm of travel), steering damper, brakes and chassis work in unison to transform the machine into a 160-horsepower, six-speed, electronically advanced, two-wheeled adventure machine. It weighs just under 500 pounds (dry), has a Motorcycle Stability Control (MSC) package with multi-mode combined ABS and multi-mode traction control (MTC), including Sport, Street, Off-road and Rain settings that allow the rider to fine tune the power application in any situation. 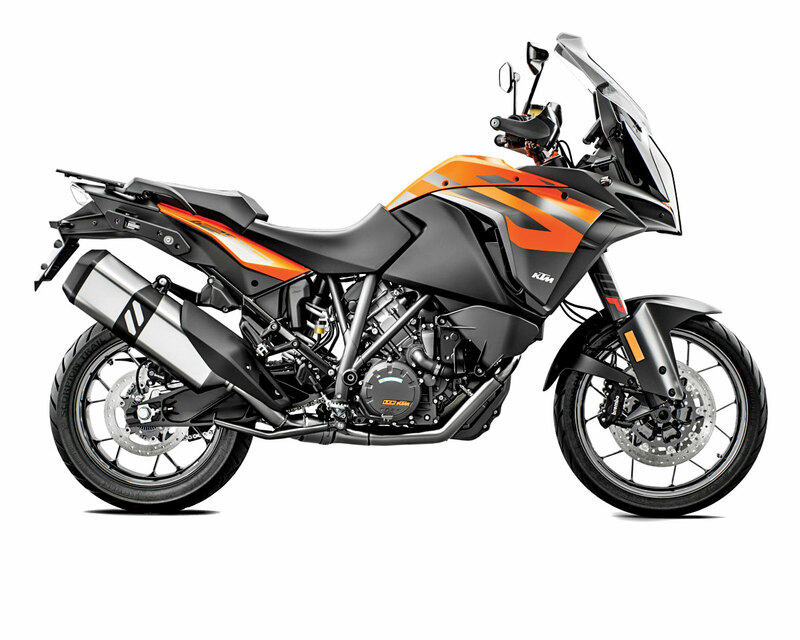 This is KTM’s more street-biased 1290 and uses new alloy rims that are lightweight and fit with a 19/17 combo of Pirelli Scorpion Trail II tires. The power and electronics are similar to those of the Adventure R, and the suspension comes with four settings: Comfort, Street, Sport, and Off-road. The dampers adjust to real-time riding through an SCU (Suspension Control Unit) adapting the damping to the terrain. The Adventure S has a windshield with a height adjuster that is operated via a self-cranking winder. 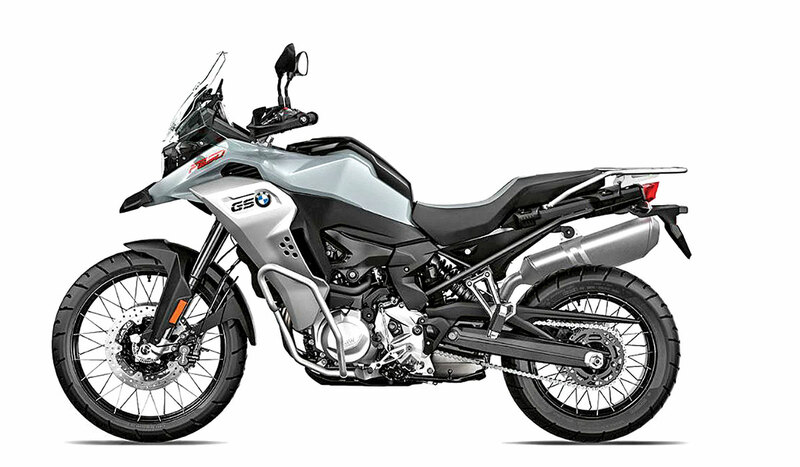 More power comes to the big kahuna of the BMW Adventure line with the R 1250 GS. The engine gained 11 horsepower, and the exhaust note has been toned down. It comes stock with two riding modes, Rain and Road, with the option for more. It has a height-adjustable seat, cast-aluminum wheels, ABS, an adjustable windshield and connectivity with the 6.5-inch TFT display. The lights are LED. It comes with a steering damper and, as with the entire BMW line, there are available upgrades for just about every facet of the machine. 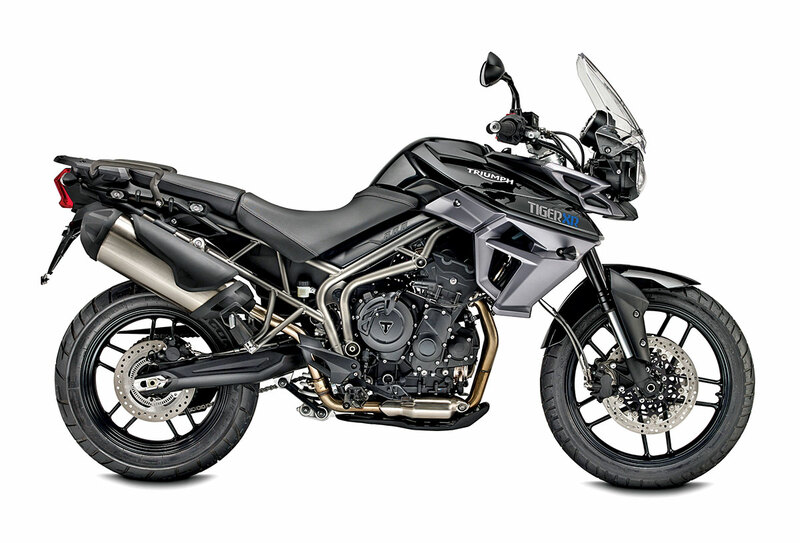 The new 1250 Adventure machine features their new engine, a big horsepower gain and uses BMW’s Shift Cam technology, which is a variable camshaft control for smoother power. Its electronics are advanced, including ABS at the base level and two standard-fitted ride modes—Rain and Road. The Adventure model has beefed-up suspension, more protection, totes more fuel (7.9 gallons) and comes with spoked wheels. 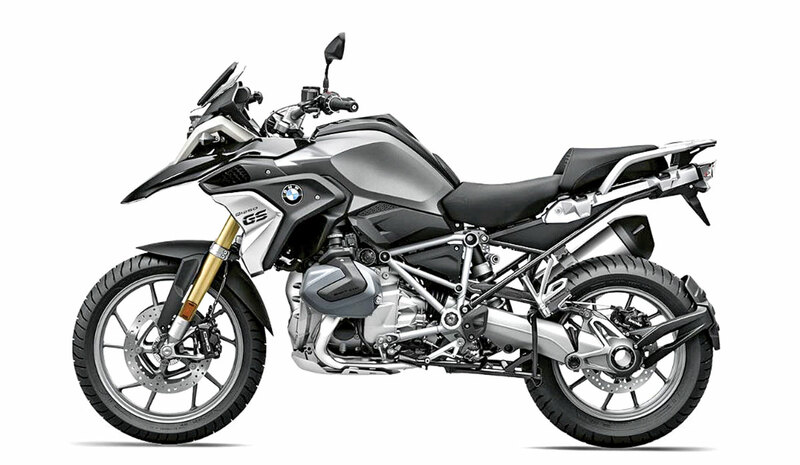 For more on the BMW R1250 GSA, click here. 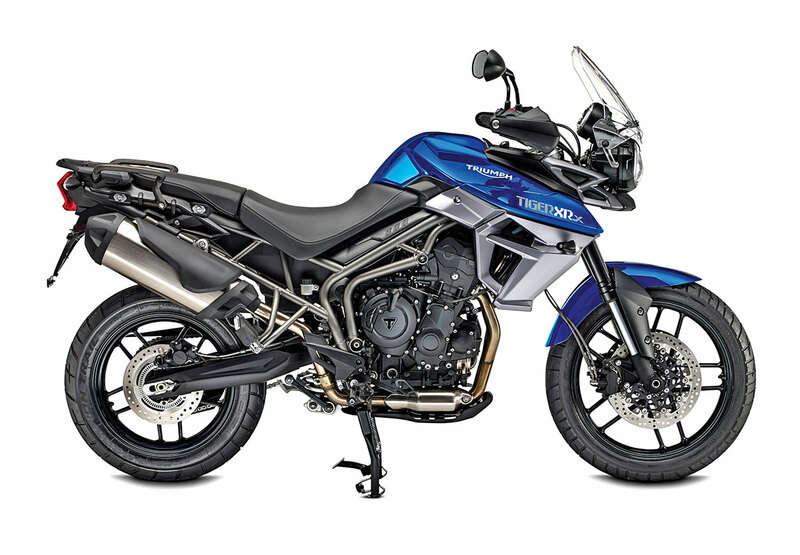 The Triumph Tiger Explorer 1200 RX is Triumph’s entry-level ADV machine that targets an optimized on-road ride. The Explorer XR model features a 1215cc triple engine and delivers its power through a final shaft drive. It comes with three riding modes: Road, Off-Road and Rain. It offers cruise control, switchable ABS, traction control, cast wheels. Brembo brakes, WP-adjustable suspension, an adjustable seat and an electronically controlled adjustable wind screen. 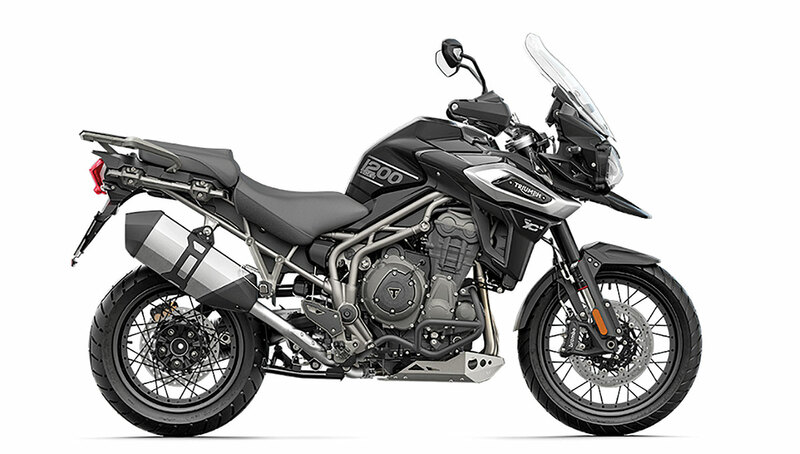 Triumph’s Tiger Explorer 1200 XRx/XRx LRH features a full-color TFT display, keyless ignition, heated grips and four riding modes: Road, Rain, Off-road, and Sport. It uses Triumph’s semi-active suspension and has optimized cornering ABS and cornering traction control. There is also a low ride height model available. It uses an electronically adjustable windscreen and is fit with adjustable WP suspension. The engine is a six-speeder, and the machine holds 5.2 gallons of fuel. The XC line is more dirt oriented thanks to the Off-Road Pro riding mode that turns off the ABS and traction control for enhanced dirt drive-ability. The XCx pumps out 139 horsepower, has five riding modes (Road, Rain, Sport, Off-Road, Off-road Pro), is lighter by 11 pounds (silencer, crankshaft, battery, flywheel) and uses spoked wheels, which are more dirt oriented. 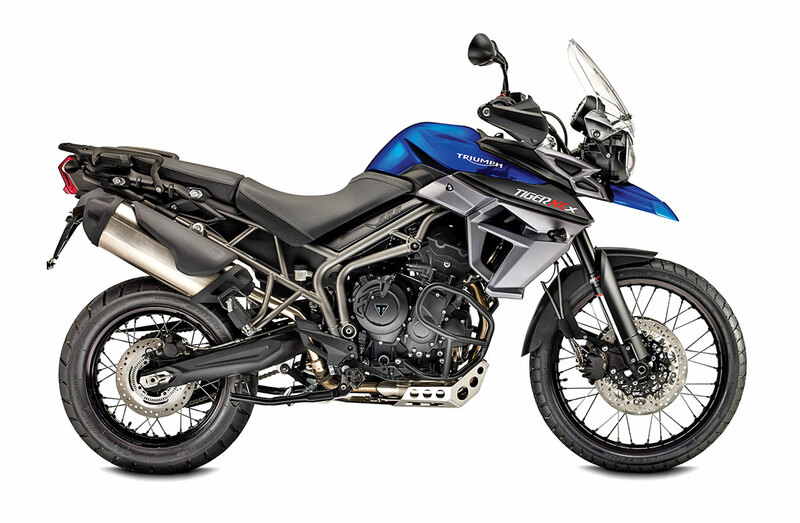 This is Triumph’s flagship 1200. 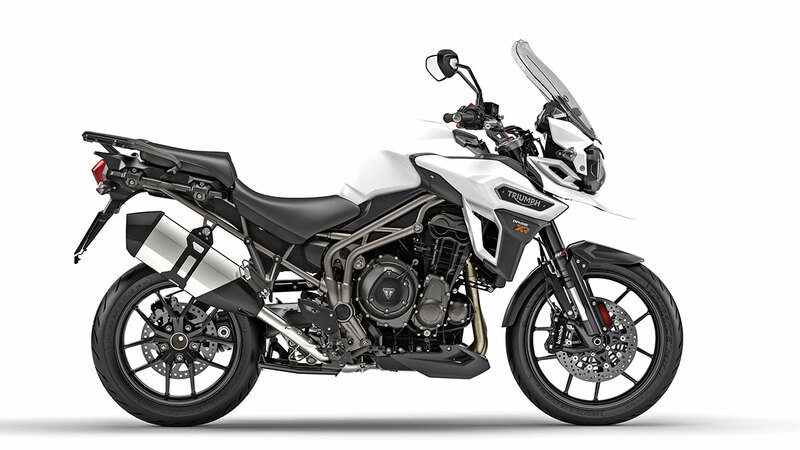 It is substantially lighter, has adaptive cornering lighting, Triumph shift assist, a high-end Arrow exhaust and six riding modes, including Rider programmable and Off-Road Pro. This is an advanced off-road setting that gives the rider maximum control over his ride precisely when he needs it. Basically, Off-Road Pro switches off ABS and traction control and sets the semi-active suspension to ‘Off-Road’ so you can really push your motorcycling to the limit. Ducati’s Multistrada 1260 Enduro has increased horsepower (to 158), Quick Shift, Vehicle Hold Control, Traction Control, Ducati’s Cornering ABS/DTC and Wheelie Control. It has a 19-inch front wheel, a double-sided swingarm, and updated suspension travel via DSS (Ducati Skyhook Suspension) Evolution, which is based on a pressurized 48mm Sachs fork. 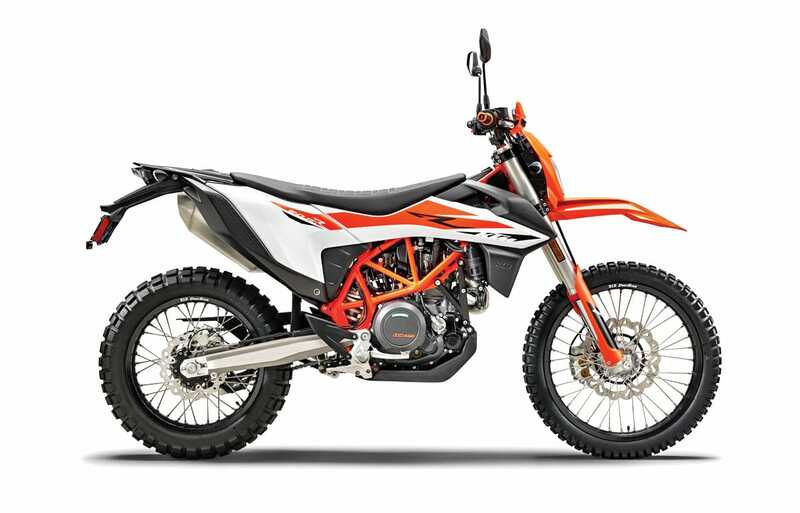 The Enduro Pro has cruise control; hands-free, backlit handlebar controls; a Ducati Multimedia System (DMS); color TFT display; LED additional spotlights; a low windshield; a steering damper; and Pirelli Scorpion tires. Yamaha’s 2019 Super Tenere has Dakar DNA built in and has a very dirt-oriented feel to the machine. The slim 1199cc parallel twin makes strong power. It’s a shaft-drive six-speed that uses a twin downdraft throttle body for control and acceleration. It has a two-position Drive Mode that allows the rider to adjust mapping for conditions. The push-button, electronically adjusted suspension has four preload settings, three damping presets and an additional seven fine-tuning damping adjustments. The Honda Africa Twin is fit with a 998cc, SOHC, eight-valve, parallel-twin engine and exhaust internals that improve midrange and sound. It uses a new lighter lithium-ion battery and comes with either a manual transmission or Honda’s automatic Dual Clutch Transmission (DCT). 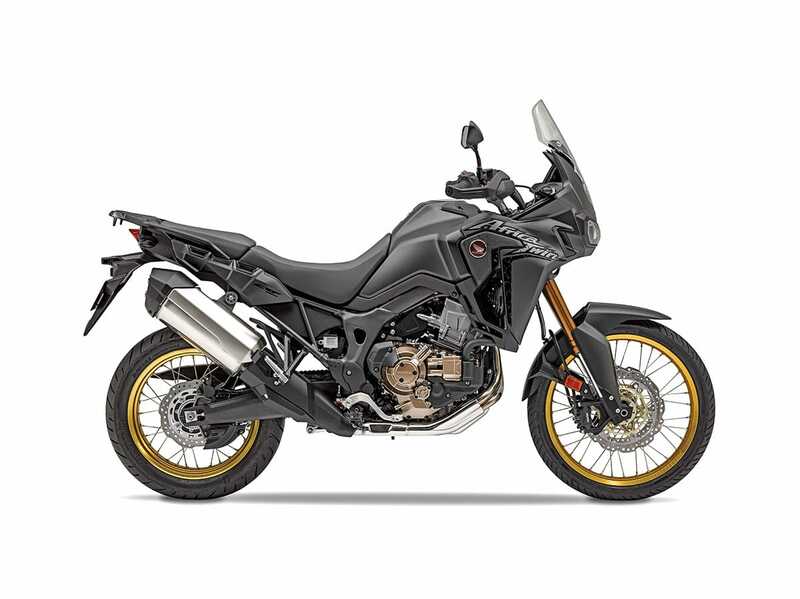 Africa Twin models have a Throttle-By-Wire system (TBW) and an expanded Honda Selectable Torque Control (HSTC) system that gives the rider seven levels of managing engine output and rear-wheel traction. Honda went big on last year’s Africa Adventure Sports model. 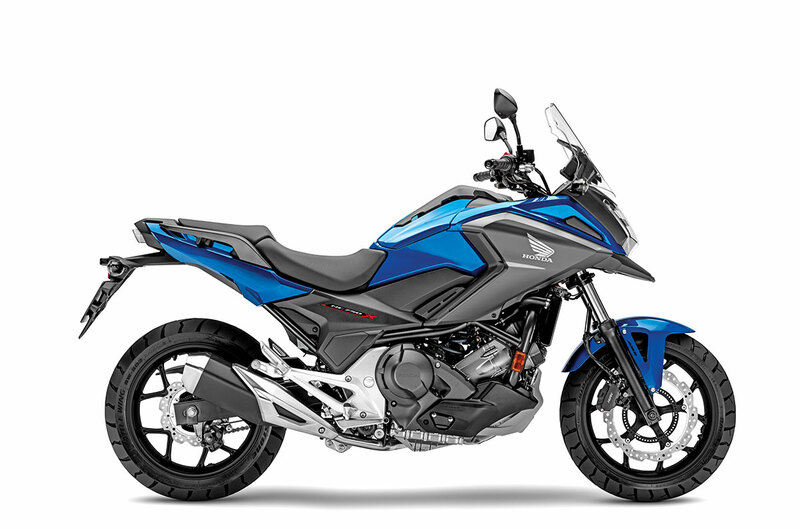 For 2019, we get new colors and retain the larger fairing, 80mm-taller windscreen and heated grips. Both suspension ends are Showa. The tank holds 6.37 gallons, and the bike has a taller saddle height than the standard Africa Twin. The Adventure Sports model has a larger sump guard and front light bars. There is a DCT model available (Dual Clutch Transmission) with a shiftless “auto” system that uses electro-hydraulic circuits to electronically engage and disengage the clutches. 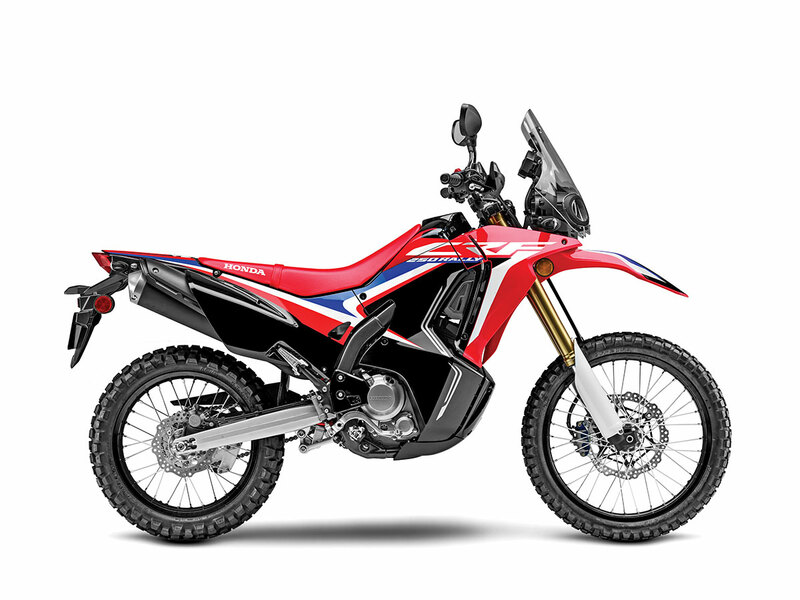 For more on the Honda Africa Twin Adventure Sports click here. 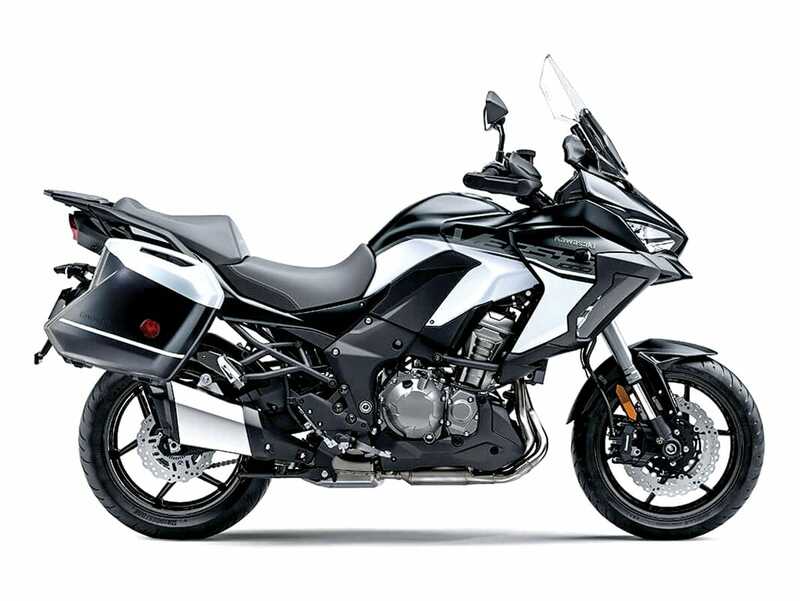 The Kawasaki Versys 1000 SE LT+ has a whole bunch of new features! 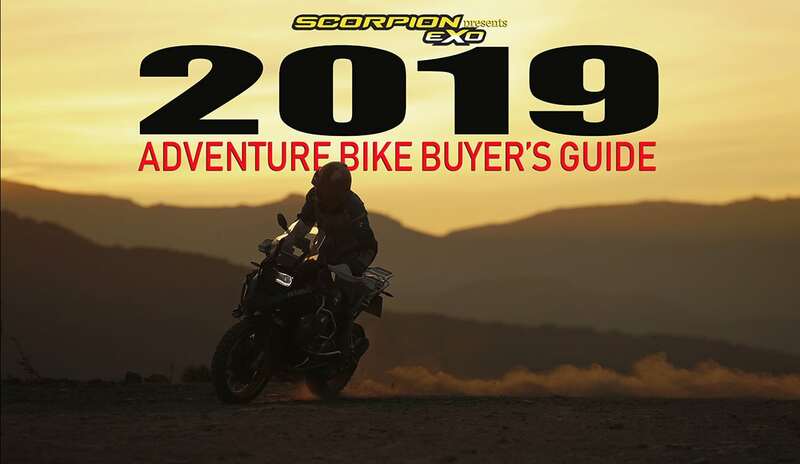 Key new aspects for 2019 include Kawasaki Electronic Control Suspension (KECS), Integrated Riding Modes, a Kawasaki Quick Shifter (KQS), Electronic Cruise Control, a TFT Color Meter and a new upper cowling and fairings. Performance wise, the Versys SW LT+ has a slipper clutch, KCMF (modulates brake force and engine power for smoother transitions from acceleration to braking), plus two power modes, Full and Low, allowing riders to select power delivery to suit their preferences and riding conditions. 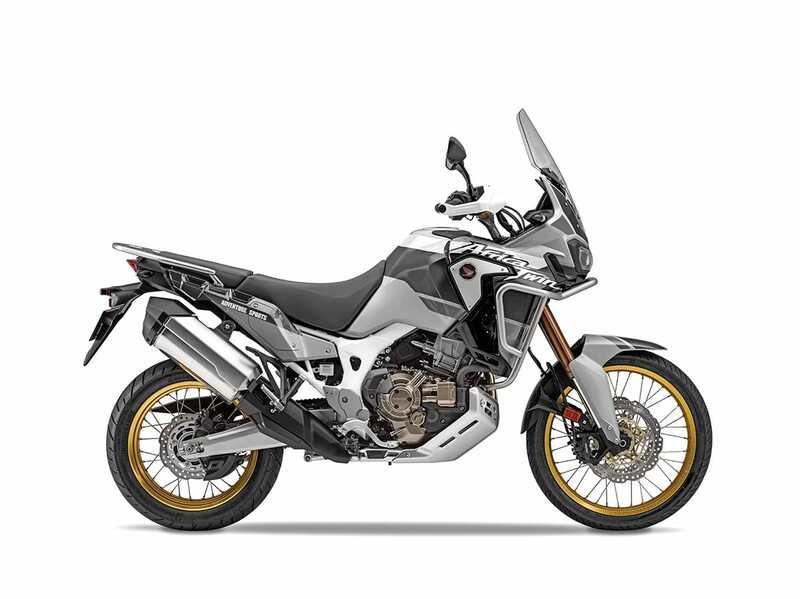 The new V-Strom 1000XT Adventure machine includes an accessory bar; center stand; heated hand grips; and 37-liter, ADV-style, aluminum panniers that clip on and off their stainless-steel mounts. The engine is a liquid-cooled, 1037cc, 90-degree V-twin and uses a five-axis Inertial Measurement Unit (IMU) that provides vehicle information to the Motion Track Anti-Lock and Combined Brake System. 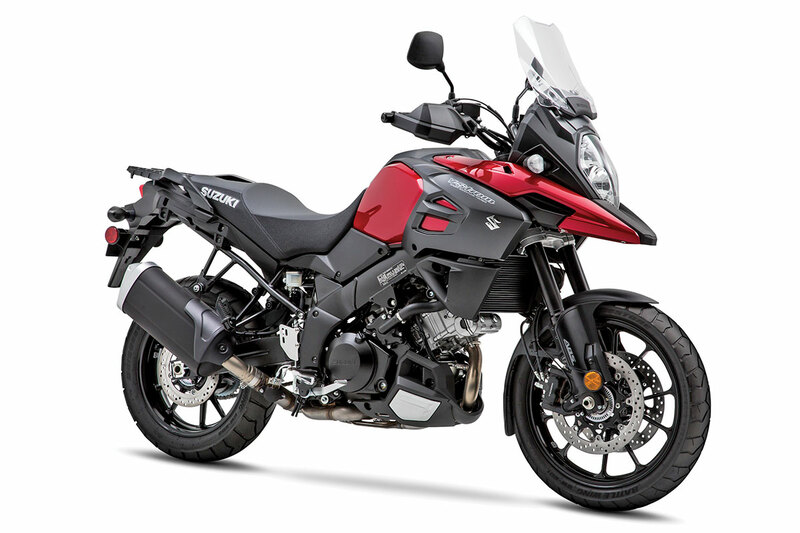 The V-Strom is fit with a DR-Big-styled fairing that has vertically stacked headlights, a manually adjustable windshield and spoked wheels. The super-ridable powerplant is equipped with Suzuki’s traction control modes, and a five-axis IMU provides data to the Motion Track Anti-lock and Combined Brake System. It lacks some of the features of the upscale XT model but is priced right and has a strong following in the ADV world. This machine is the more street-biased version and is fit with cast wheels. While it has the appeal of a canyon machine, the Multistrada 950 has the technology to handle the lighter facets of the ADV world. Powered by a liquid-cooled, twin, 937cc powerplant with 113 horsepower, the Multistrada 950 caters to a more street-happy environment. 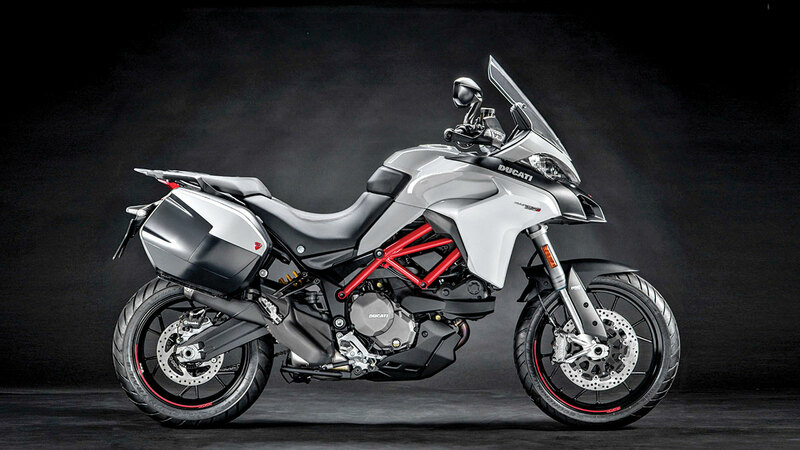 This year, Ducati offers an S version equipped with a Ducati Skyhook Suspension (DSS) Evo system, Ducati Quick Shift up and down (DQS), a full-LED headlight with Ducati Cornering Lights (DCL), a 5-inch color TFT display, hands-free system, cruise control and backlit handlebar controls. The classic Moto Guzzi Stelvio is no longer being offered, a victim of the Euro 4 emission standard. In its place is a midrange ADV bike with a more practical price and size. The V85TT has an all-new, 850cc, fuel-injected motor. The design goals of the new bike were to offer a lower seat height and more manageability to attract newcomers to the adventure market. The Adventure model shown here will come with panniers and a travel trunk. The 850 GS got more power (now 90 horsepower) compared to the older 800 GS. It comes fit with Automatic Stability Control (ASC), which regulates the power transmission to the rear wheel while standard Road and Rain ride modes regulate the throttle response. You can upgrade and add the Pro mode and Dynamic ESA to enhance the versatility and stability of the machine. And for those of you who can’t leave home without your smartphones, you can connect via Bluetooth and activate a wide range of functions. 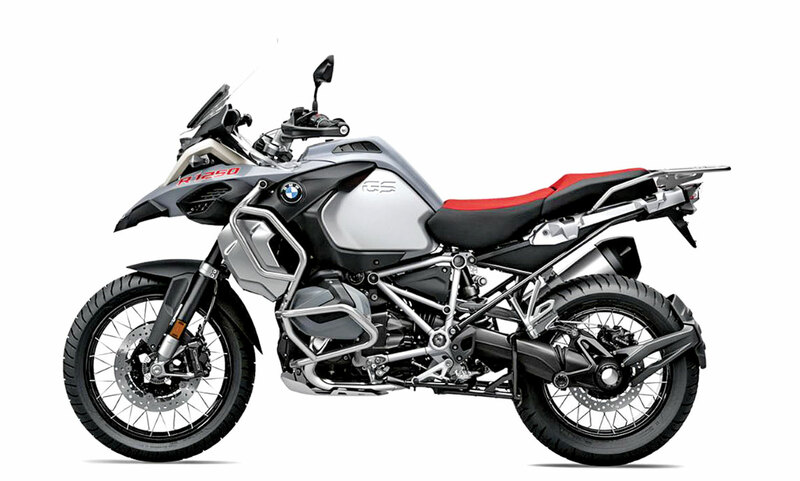 BMW’s more off-road-oriented adventure machine, the new 850 GS Adventure, has a new 90-horsepower, parallel-twin, water-cooled engine. The fuel tank totes 6.1 gallons. The wheels are cross-spoked, and the front is a 21-inch (preferred by the explorer types). The windshield is adjustable. There are two ride modes (rain/road), ABS, and it comes with a rack and engine guards for protection. The front suspension is handled by upside-down telescopic forks and by the WAD suspension strut on the back end. 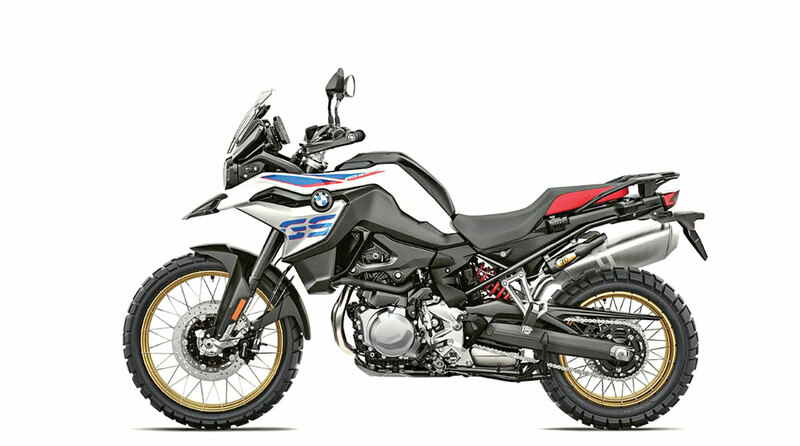 The F 850 GS Adventure offers 9.1 inches of front suspension travel and 8.5 inches of rear suspension travel, targeting a bigger appetite for off-road. 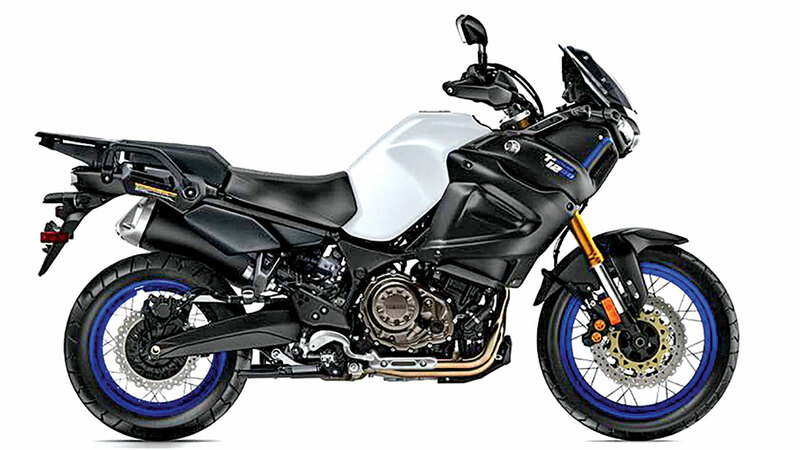 For more on the BMW F850GS, click here. The Scrambler line continues to evolve over at Ducati with a long list of changes to make the bike more legitimate in the dirt. The bike now has a racing pedigree, with wins in such diverse events as flat track Super Hooligan racing and the Elsinore GP. There are four different Scrambler Ducatis with the 803cc, L-Twin engine: the Icon, the Cafe Racer, the Desert Sled and the Full Throttle. There is also an 1100 series that includes three different versions. 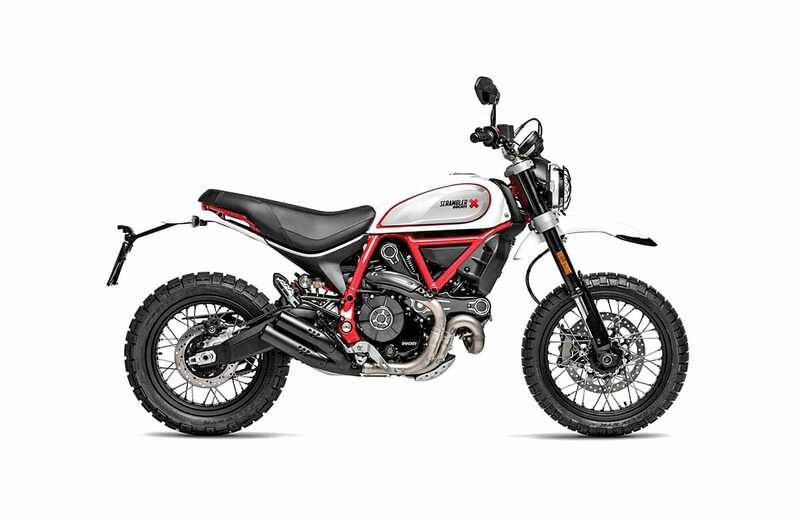 For more on the Scrambler Ducati Desert Sled, click here. The more road-based 800 from the Triumph line, the XR uses cast wheels, a 19-inch front, Ride-by-Wire throttle, switchable ABS and traction control. It makes 94 horsepower via the liquid-cooled, DOHC, inline, 800cc triple. It’s fit with an on-board computer and height-adjustable seats and updated cruise control. 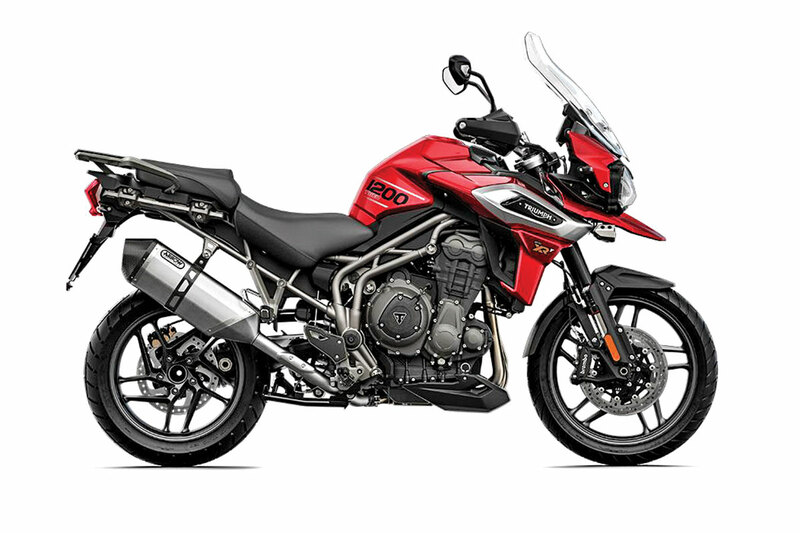 The higher-end Tiger 800 XRx comes adorned with the 5-inch, full-color, TFT display; a new cruise control; Brembo brakes; and four ride modes—Road, Rain, Off-Road and Sport. It uses a Ride-by-Wire throttle, has a new lower first gear, and is fit with hand guards and heated grips. The wheels are cast, a 19-inch front and a 17-inch rear, and the dry weight of the XRx is 441 pounds. 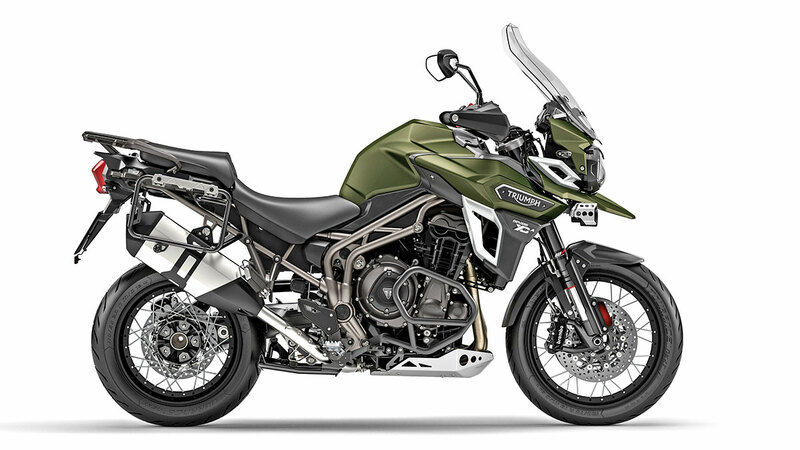 At the highest end of the XR line, the Tiger 800 XRt boasts an adjustable Showa front and rear suspension (7.09 inches front/6. 69 inches rear), LED lighting, a TFT display, heated grips and a heated seat. It has ABS, traction control and five ride modes: Road, Rain, Off-Road, Sport and Rider programmable. The machine totes 5.0 gallons of fuel. 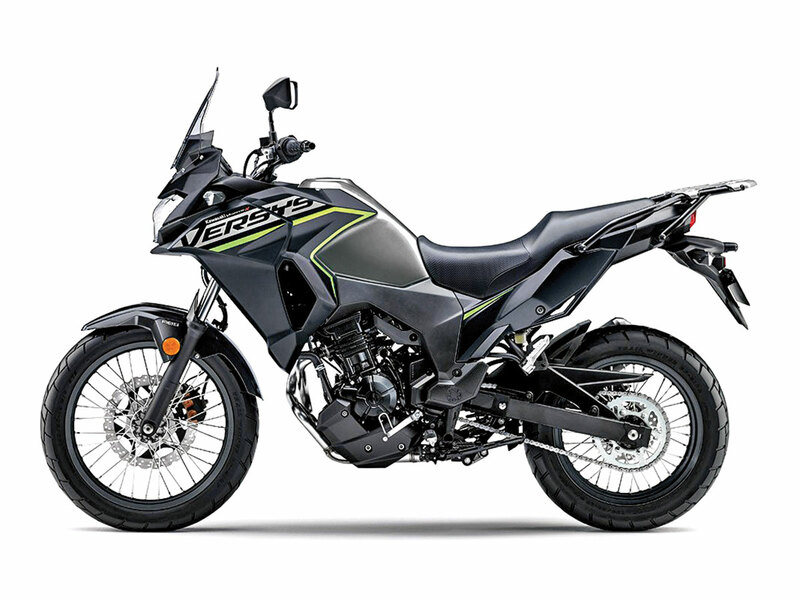 Focused more on off-road versatility, the Tiger XCx features Brembo brakes, a lower first gear for better traction, WP adjustable suspension (8.66 inches front/8.46 inches rear) for the more adventurous dirt explorer, and five ride modes: Off-Road, Off-Road Pro, Road, Rain and Sport. 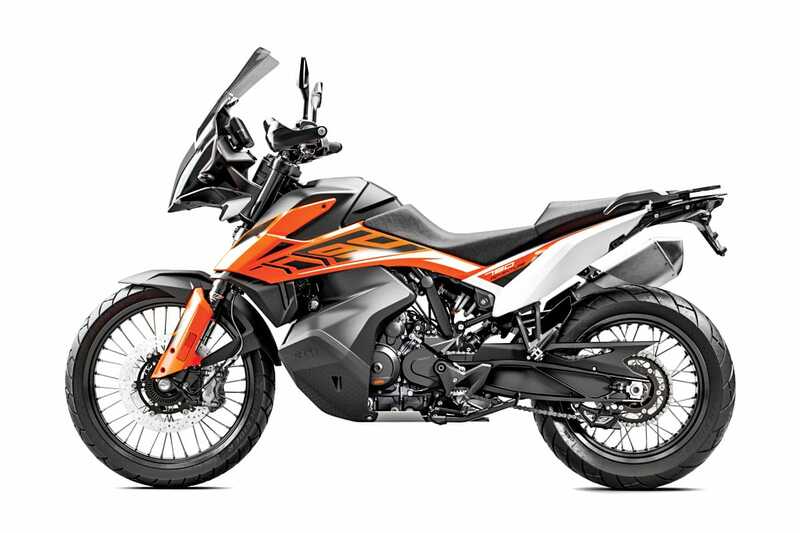 The seat height is adjustable, and the bike comes with hand guards, switchable ABS and traction control. The XCa has Triumph’s highest level of instrumentation, heated grips and a heated seat, all LED lighting and five ride modes: Off-Road Pro, Off-Road, Road, Rain, Sport, and Rider Programmable. Standard equipment includes LED fog lamps and auxiliary sockets. It uses a 21-inch front wheel for off-road performance with a high-level front mudguard and weighs 452 pounds dry. 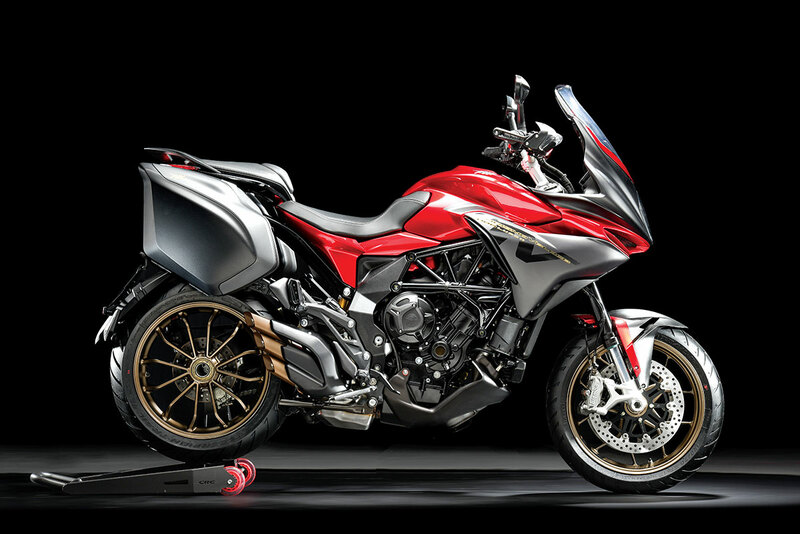 MV Agusta is a company with true history. The factory is on the shores of Lago Varese, north of Milan, Italy, where WWII fighters were once produced. The Lusso is a high-end adventure bike with a 798cc, three-cylinder motor. It’s said to produce 110 horsepower. The model shown here is the RCTV Special Edition, which sells for $25,998. 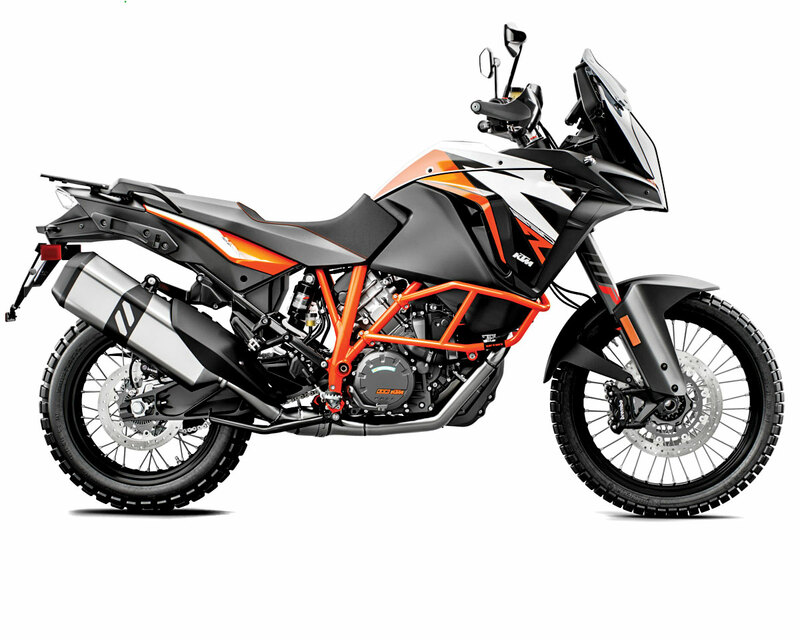 KTM’s newest Adventure machine, the 790 Adventure R, focuses on the hard-core ADV rider who has a preference for off-road travel. It churns out 95 horsepower, has a six-speed gearbox and is quite compact. It comes with ABS, MTC and has ride modes to assist in a variety of conditions. MTC (Motorcycle Traction Control) is KTM’s lean-angle sensitive traction-control system that reacts immediately to the rotational speed of the rear wheel. The Rally mode allows more direct control over the various functions. It is equipped with big-boy WP dampers, a steering damper and an adjustable, low-profile windscreen. BMW pumped its 700 GS up to a 750, resulting in 77 horsepower out of the parallel twin engine. 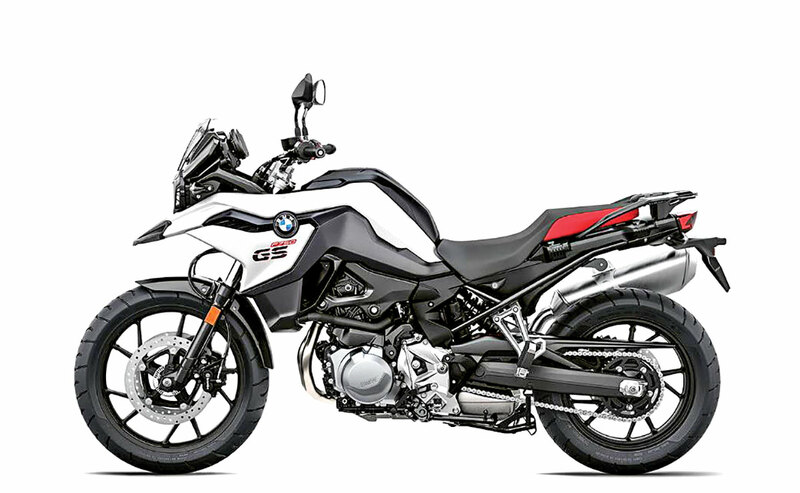 Like its siblings, the F 750 GS uses a slipper clutch, ABS braking, an on-board computer and, because this BMW is more street oriented, cast-aluminum wheels. The seat height is adjustable, and with optional connectivity you can connect your smartphone to the F 750 GS via Bluetooth and operate a wide range of innovative functions via the intuitive multi-controller on the handlebars. 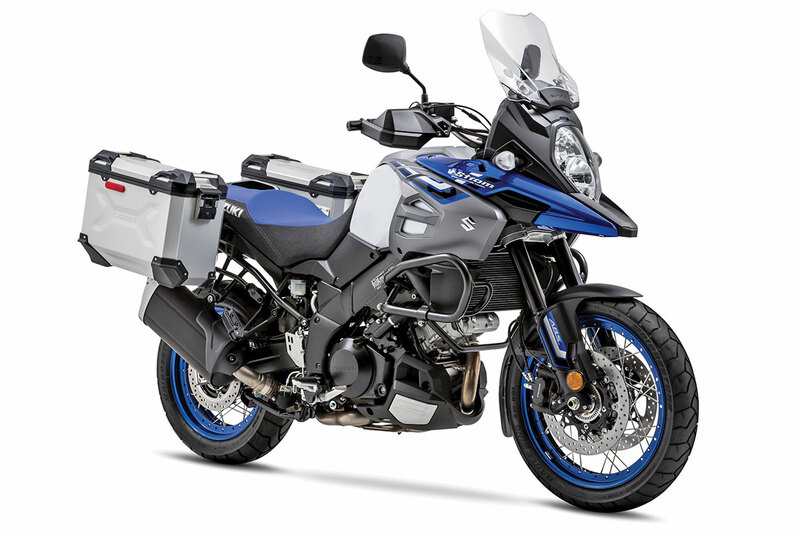 For more on the BMW F750GS, click here. 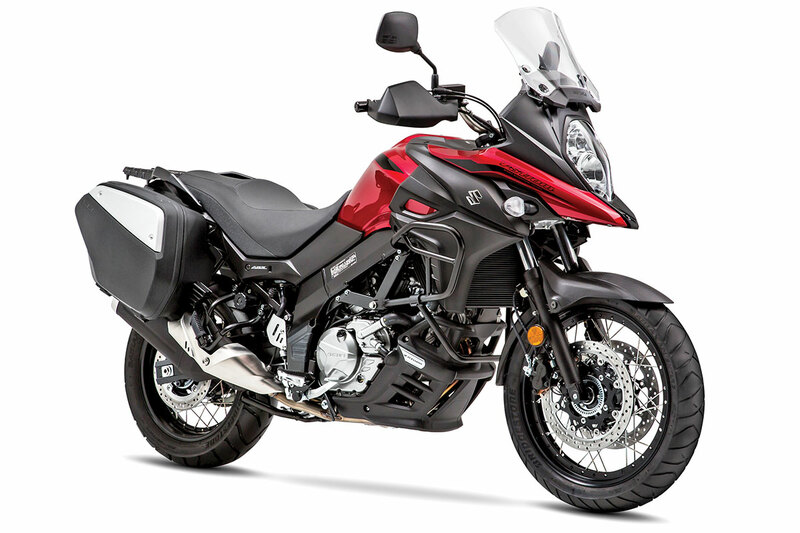 Last year, Honda increased the displacement on the SOHC, eight-valve parallel twin by 75cc (making it 745cc), added two-level Honda Selectable Torque Control (HSTC) and made mode changes to the automatic Dual Clutch Transmission (DCT). The suspension is Showa. It uses cast-aluminum wheels. The instruments use a negative LCD display that has odometer, trip-meter, gear-position, fuel-economy and consumption gauges. A heated grip temperature gauge is optional. The DCT model also offers a three-stage Sport mode. When Germany retreated from Russia in 1944, the motorcycles that were left behind so impressed the Soviet Army that they inspired a breed of Russian-made offspring. 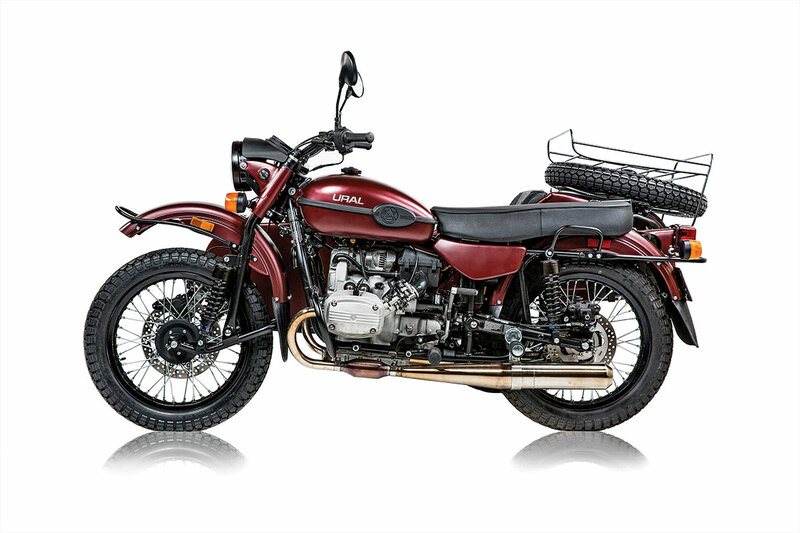 Ural motorcycles still adheres to that legacy today. The Gear Up is the most dirt oriented of the 750cc, opposed-twin sidecar motorcycles. It has two-wheel drive, reverse and a spare tire. The Gear Up now has Keihin fuel injection and produces 41 horsepower. There’s an optional three-year warranty. For more on the Ural Gear Up, click here. 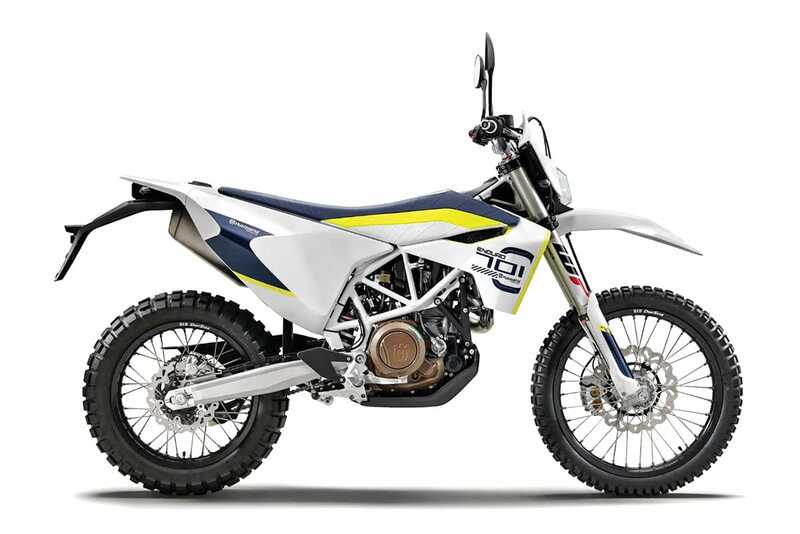 The Husky 701 Enduro is virtually naked in the ADV world because it’s very dirt oriented. It features a single overhead cam with a two-spark-plug ignition and a slipper clutch. The 701 puts out 74 horsepower and uses a WP 4CS fork with just under 11 inches of travel and WP linkage rear shock. The stripped chassis is stark, but is fit with Magura hydraulics, Bosch ABS braking, a 21/18-wheel size, 300mm front disc and Ride-by-Wire technology. The KTM 690 Enduro R has strong roots in both the dual-sport world and the ADV arena. 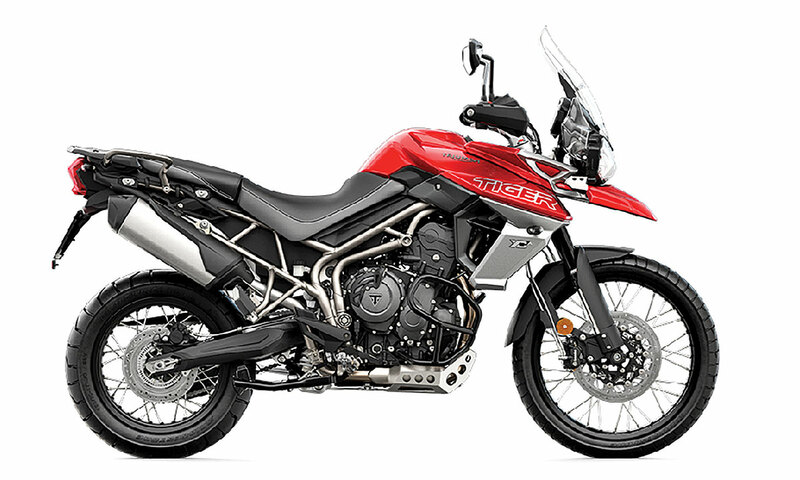 It’s a stripped-down Adventure bike and has an impressive single-cylinder powerplant. The six-speeder is fit with a slipper clutch and features a twin-plug ignition and Ride-by-Wire technology. There are two ride modes. It has a lean-angle sensor and comes fit with quality WP suspension (Xplor fork and Xplor shock and linkage). Although it’s a cut-to-the-bone dirt bike, it has a taste for the adventure world. 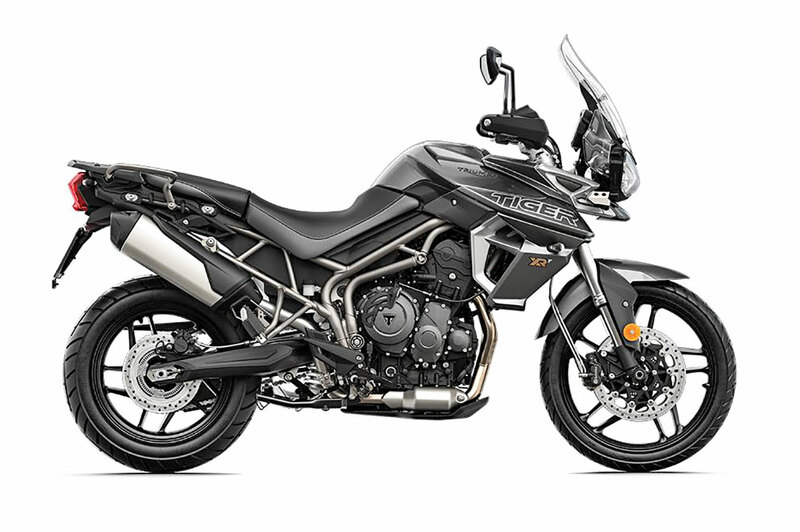 The Versys 650 features a 649cc parallel-twin engine, a six-speed gearbox and sealed chain driveline. Cast-aluminum 17-inch wheels, ABS braking with dual rotors up front, and just under 6 inches of travel target the adventure side of touring. She totes 5.5 gallons of fuel, weighs 476 pounds with all the fluids (including gas), and has an adjustable windscreen. 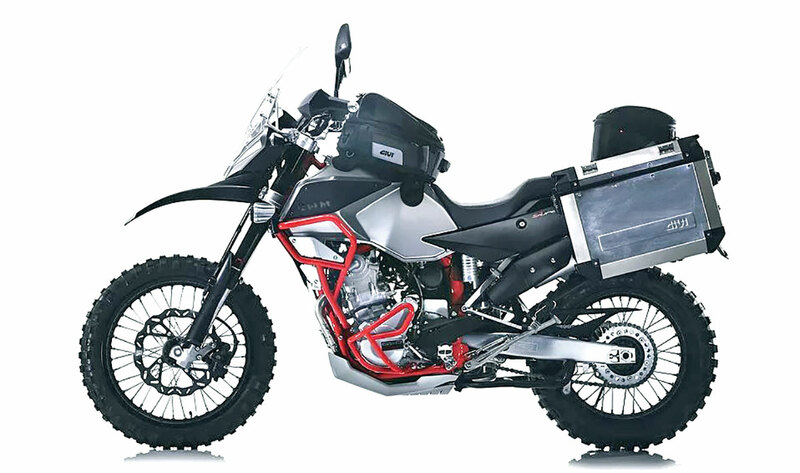 SWM’s adventure machine is based around a 600cc, fuel-injected, single-cylinder, DOHC four-stroke. It’s fit with a cooling fan. It’s a six-speed, uses a Fast Ace upside-down fork and a Sach’s Progressive “soft damp” rear shock. Wheels are dirt-oriented, using a 21-inch front and 18-inch rear. The fuel capacity is 3.2 gallons. It has a fairing, engine guards, big disc brakes and a very competitive price tag, coming in under 9000 dollars. 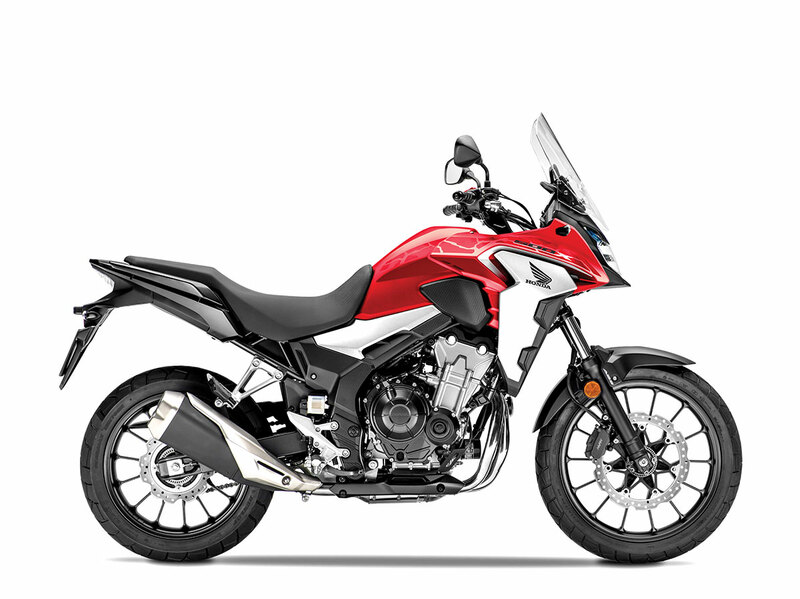 The Honda CB500X received some performance updates that improved the torque of the machine. It is equipped with a 471cc, parallel-twin, DOHC engine with fuel Injection. The revamped intake tract and fuel injection mate to a slipper clutch with a lighter pull and smoother downshifts. The front wheel is now a 19-inch model, and there is increased suspension travel at both ends. 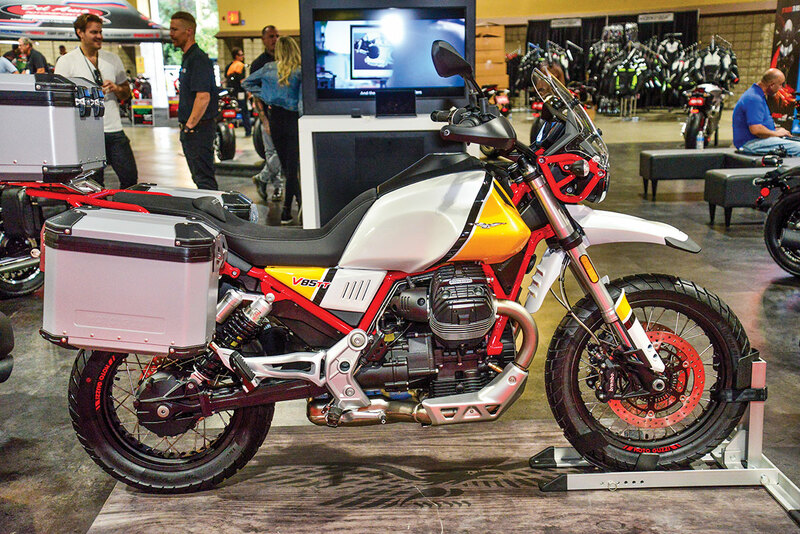 This is an accessorized version of the V-Strom XT that comes with tubeless ADV tires, spoked wheels, a set of Suzuki side cases, an accessory bar, hand guards, a lower engine cowl, and a center stand. It features ABS braking, Suzuki’s ATC (Advanced Traction Control) and Low-rpm assist. There are three traction-control modes (1, 2, and Off), with varying sensitivity to road conditions. 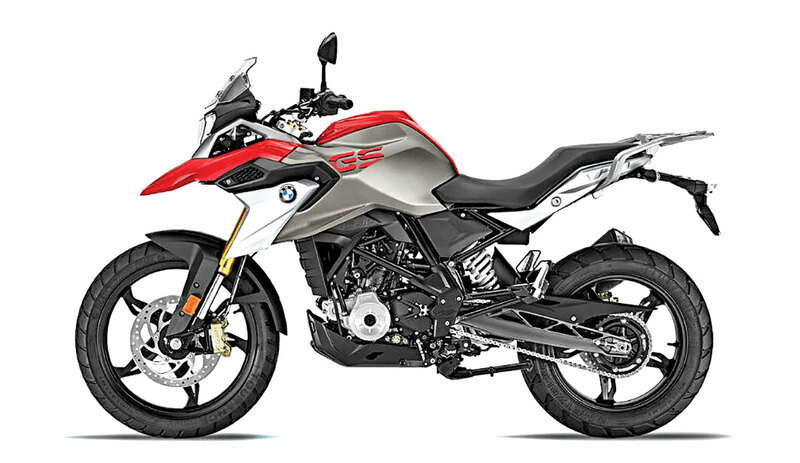 BMW’s 310 GS price tag is designed to coax riders to take a look at the BMW lineup. Its motor is a liquid-cooled, single-cylinder six-speed that makes peak power at 10,500 rpm. The frame is tubular steel and is fit with an upside-down fork with 7 inches of travel. It comes with two-channel ABS braking and a 19-inch front wheel mated to a 17-inch rear. It weighs 387 pounds fully fueled up. 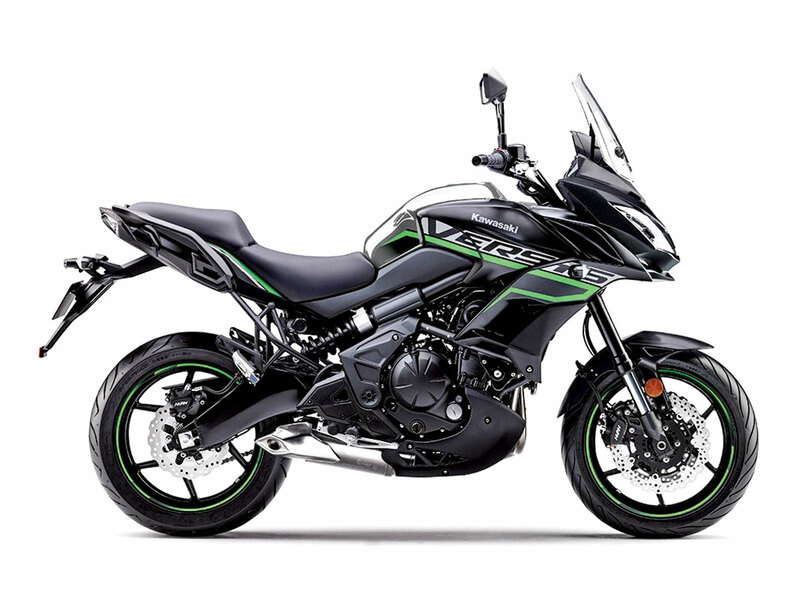 The Versys-X is Kawasaki’s smallest machine designed for adventure touring. It’s powered by a 296cc parallel twin that is fed through a digital fuel-injection system. It comes equipped with a 41mm Showa fork, a 19-inch front wheel, a 17-inch rear wheel and a 4.5-gallon fuel tank that is good for a long exploration ride. An ABS models can be had for $300 more.